They added a modest 161,000 new jobs last month. Wage gains accelerated, however, bringing the annual increase to 2.8 pct, the biggest since 2009. That could help lift consumer spending, an important engine of economic growth, heading into the holiday shopping season. 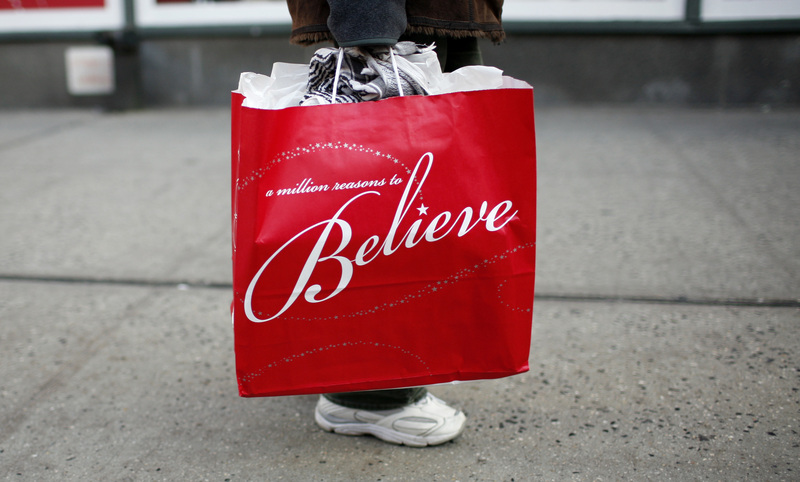 A woman carries a shopping bag from Macy's department store as she walks along 34th street in New York City, December 23, 2008. The U.S. economy added 161,000 jobs in October, while the unemployment rate fell by 0.1 percentage point to 4.9 percent, the Bureau of Labor Statistics reported on Nov. 4. Analysts expected growth of 175,000 positions. Average hourly wages increased by 10 cents to $25.92 from September, bringing growth so far this year to 2.8 percent, the largest gain since June 2009. The labor-force participation rate fell slightly, to 62.8 percent. Healthcare and business-services sectors saw the biggest job growth. Payroll figures for August and September were revised upward for a total gain of 44,000 additional jobs.